At the site of the Elah Fortress where some of the site has been excavated. 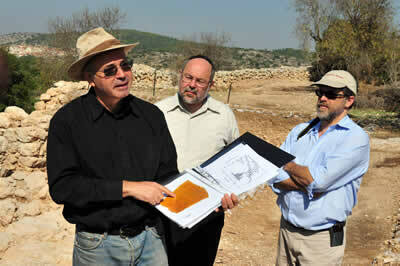 At the site of the Elah Fortress, overlooking the Elah Valley in the land that David slew Goliath, archaeologists have discovered the oldest Hebrew text ever found dating back 3,000 years - 1,000 years older than the Dead sea scrolls, at a hidden fortress believed to be King David's front line fortress in the war against the Philistines. The ancient discovered settlement is situated at a strategic point among four biblical cities in Judah's inheritance and is fortified with a massive perimeter wall of 700 meters taking 200,000 tons of rock to build it with one 4-6 chambered gate 10.5 meters across being the dominant feature. To date only 4% of the site has been excavated, promising many additional discoveries in the remaining 96% - a process that will likely take around 10 years. The discoveries made so far have already caused a commotion, exciting many world renowned archaeologists, overturning and revising several current archaeological theories, pushing each expert to review their own excavations in light of the remarkable nature of this site. They have already made dramatic discoveries at the Elah fortress, including a pottery shard inscribed with writing with the earliest and longest Hebrew text ever found, olive pits dating to the time of King David, rare silver coins, and over 100 pottery handles with a distinct fingerprint impression which may indicate a link to royal vessels - such a quantity of this feature found in one small locale is unprecedented. Until now, archaeological records of the kingdom of Judah were almost nonexistent and a number of scholars today argue that the kingdom of Judah was largely a myth created some centuries later, some believe the discovery of the Elah Fortress may well fundamentally change the world's textbooks regarding to the history of the Jewish people and the biblical narrative which has huge symbolic value for Israel, Jews and Christians. 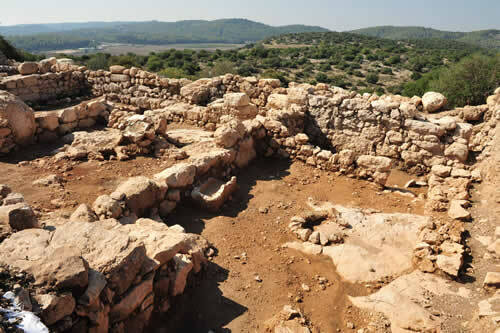 The archaeologists involved in the dig have come to a universal consensus that the site was inhabited by the earliest urban civilization of Judah and have said that items discovered so far at the site such as ceramics, a Hebrew text pottery shard and the lack of pig bones at the fortress indicate most likely that King David ruled over Jerusalem and ancient Israel during the controversial period of 10th century B.C.E. Professor Yosef Garfinkel of the Hebrew University in Jerusalem had been looking to work on such a unique project for months and explained how the find is an archaeologists paradise and holds so much promise because it was in use for only a short period of 20 years, and then destroyed without being inhabited - possibly during a battle against the Philistines giving it a single layer of civilization making the remains accurate to date. "There is so much to discover in this archaeological dig that everyone will be able to find something that could help solve the mysteries of the past" said Mr. Garfinkel. The developers of the site, Foundation Stone are inviting the public and tourists from all over the world to participate in the dig in the summer of 2009, to discover a little piece of history for themselves.